Although Germany never had the extensive colonial empires of England or France, it nevertheless was involved in a series of hard-fought campaigns against native forces which consisted of everything from skirmishes to outright wars. Perhaps not as colorful as some British and French military adventures, German colonial wars were every bit as hard fought. Germany possessed four colonies in Africa: German East Africa (Tanzania), Togoland (Togo), Kameruun (Cameroon) and German Southwest Africa (Namibia). All were lost to England and France during the course of World War 1. All four were sites of conflicts between the natives that dwelled there and the German colonial troops called "Schutztruppe." The Schutztruppe was one of the smallest colonial forces in the world, smaller then even than the forces of Portugal and Belgium. In 1900, it numbered only 3,000 officers and men and in 1914, it consisted of 6,461 officers and men, of which fourteen companies were stationed in East Africa, nine companies in Southwest Africa and twelve companies in Kameruun. Togo did not have a Schutztruppe per se; instead they had a paramilitary police organization. In times of crisis or need the Schutztruppe would receive aid from German Marines stationed abroad, patrolling German warships in the area or from regular army units sent to the colonies from Germany itself. The officers and NCO's of the Schutztruppe were white, regular officers and NCO's from the German Imperial army. The desire to serve with the Schutztruppe was high. The pay was good and it was a chance to see exotic lands and military action, which appealed to bored officers in peacetime Germany. 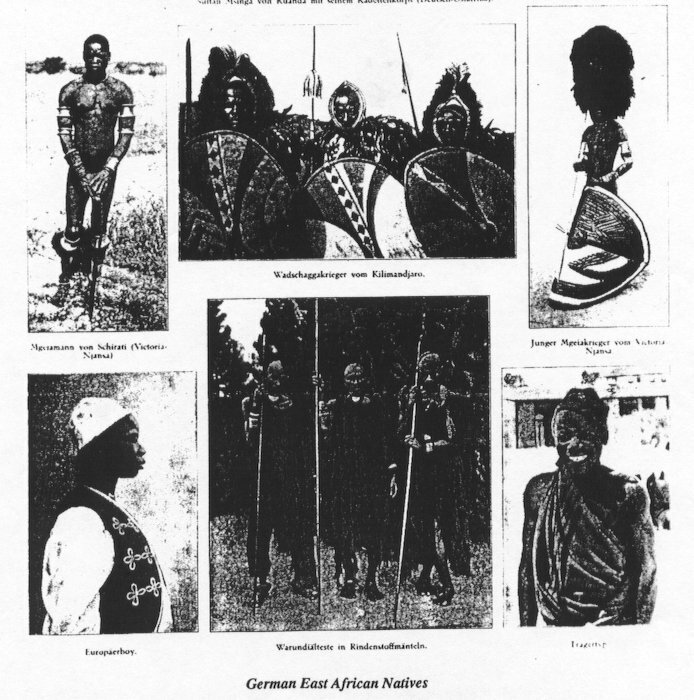 The enlisted men, or "askaris", were local natives. They generally enlisted for an initial five-year term and then reenlist on a yearly basis. The uniform worn was khaki and the askari were armed with either the Mark 71 or 84 model single shot rifle. The askaris were very loyal and well trained. The Germans stressed discipline and marksmanship. In the field, the askaris were taught to fight on a company level. In 1884, German trading companies founded all four German colonies in Africa. Within several years, they proved unable to cope with the problems of running a colony, so the Imperial German government had to take over their administration. The Germans' desire to push inland and expand their holdings led to conflicts with the natives and the creation of the Schutztruppe. For the next twenty-odd years, there was almost constant fighting in at least one of the colonies. The numerous and varied skirmishes, campaigns and wars with the native tribes are reminiscent of the American Indian Wars. Small groups of German troops patrolling and trying to control a vast amount of land. As the warfare is so voluminous, this article will only focus on the more major conflicts in these colonies. There were three principle wars or campaigns fought by the Germans in East Africa. The Abushiri Rebellion in 18881890, HeHe War in 1891-1898, and the Maji-Maji Revolt in 1905-1907. The Abushiri Rebellion began in 1888 against the German East Africa trading company which, through treaties, gained control over a number of cities and trading posts along the coast of the Indian Ocean. This was not appreciated by the Arabic traders who had dominated the trade routes before the Germans nor a number of coastal native tribes who resented the growing influence and power of the German's over them. Instigating the rebellion was Abushiri ibn Salim al-Harthi, a local wealthy Arab who united the Arab traders and local tribes in a common effort to remove the Germans. On September 20, 1888 the uprising struck the unexpecting Germans. Trading posts and cities fell to the attack. In a short period of time, only the cities of Dar es Salaam and Bagamoyo held out on the coast while two trading posts farther inland, Kilwa and Kivinje, were under siege. The German trading company, unable to control the situation, appealed to the German government for aid. On September 22, Abushiri with 8,000 men assaulted Bagamoyo, the capital city. The fighting was intense and the city nearly destroyed before a German Marine detachment of 260 men relieved the city. Shortly afterwards, a rebel attack on Dar es Salaam also failed and the offensive switched to the Germans. Responding to the crisis, the German government sent thirty-four year-old Hermann von Wissmann as the first commissioner to the colony. With Wissmann were twenty-one officers, forty NCO's and 600 Sudanese and 400 Shangaen mercenaries who would soon become the core for the new Schutztruppe. Wissmann used the navy to restore control over the coastal cities taken by the rebels. Naval bombardments soon forced their defenders out and allowed the German forces to reoccupy them. The Navy was further used to set up a tight blockade of the coast in order to stop any possible arms or equipment going to the rebels. In May 1889, Wissmann moved against Abushiri's stronghold at Jahazi, a fortified village near Bagamoyo. By this time, Abushiri's alliance had collapsed. Most of the native tribes had given up towards the end of 1888 and Abushiri had to hire Arab mercenaries in order to defend his stronghold and keep the rebellion alive. On May 8th, German forces under Wissmann attacked Jahazi defended by Abushiri's well-armed mercenaries and surrounded by a 2.5 meter high wall. Using artillery fire, Wissmann drove the defenders back from the wall then led a charge that stormed the fort. One hundred and six Arabs were killed in the attack, Jahazi was taken but Abushiri escaped into the interior where he persuaded the Yao and Mbunga tribes to continue the war. As Wissmann was busy retaking the cities of Pangani, Sadani, and Tanga, Abushiri led new assaults against Dares Salaam and Bagamoyo which were repulsed with heavy losses to the natives. Following these new losses and unable to defeat the better-armed Germans with spears and shields, the Yao and Mbungaand deserted Abushiri, who was again forced to flee. By December 1889, the rebellion was all but over. 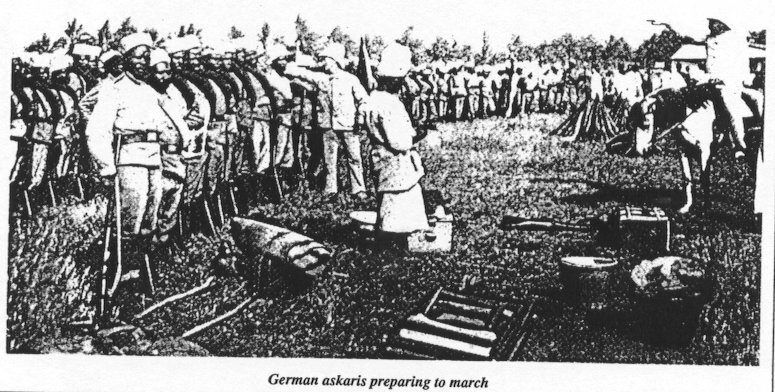 Abushiri was turned over to the Germans by some natives on December 15th and he was quickly hanged, the last dying embers of the revolt put out. 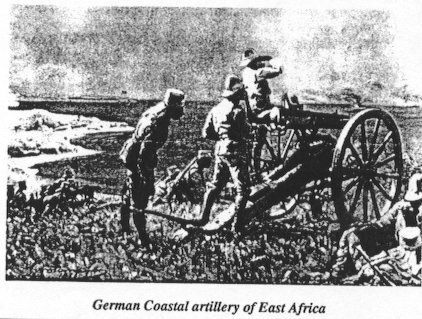 Having secured the coast, now an imperial colony, the Germans in East Africa began to push into the interior. Minor wars were fought with the natives as Wissmann played one tribe against another, thus extending the size of the colony. During this time, the Schutztruppe was enlarged to include local natives and increased to fourteen companies, some 226 German and 2,664 askaris. These fourteen companies were to patrol, guard and defend 360,000 square miles of territory. They built a series of small garrisoned and fortified areas. It was not uncommon for two officers and 100 men to be in charge of an area which contained up to one million natives. This situation led to resistance and revolt from the natives, like the HeHe who announced their independence from the Germans in the south central region of the colony in 1891. They were led by a young, aggressive and intelligent chief named Mkwawa. The Germans attempted a peace policy of negotiation, even removing Wissmann as commissioner for being too militant, but their efforts were rebuffed. Thus in July 1891, the new commissioner, Emil von Zelewski was ordered to teach the HeHe some respect for German authority. Zelewski's punitive force-three companies of the Schutztruppe-consisted of himself, 13 German officers and NCO's, 320 askaris, 170 porters, and several machine guns and field guns. With this force, Zelewski arrogantly entered HeHe territory without taking any defensive precautions. On July 30,1891, Zelewski forces burned dime villages and shot three envoys that Mkwawa had sent in order to open discussions with the Germans. Alarmed Mkwawa ordered the mobilization of his army for war. Continuing his campaign, Zelewski and his men passed through a rough mountainous area. The trail was small and strewn with rocks and boulders. On August 17, the HeHe army of 3,000 men led by Mkwawa's brother, Mpangie, struck the spread-out column. Armed with spears and a few guns, the HeHe rushed the column in an effort to force hand-to-hand combat. The askari, taken by surprise, were only able to get off one or two rounds before being set upon by the charging HeHe. The battle soon became a massacre with German resistance over within ten to fifteen minutes. Zelewski was one of the first killed along with 360 men of his command. Only three Germans, sixty-four askaris and seventy four porters escaped the debacle. Two hundred sixty HeHe died as well. Shocked by the defeat, the Germans burned with a desire for revenge. Captain Thomas von Prince led a series of raids against the HeHe in 1892. Mkwawa retaliated by wiping out a German garrison at Kondoa. The next couple of years saw a continuation of such engagements. Upon the arrival of the new commissioner, Colonel Freiherr von Schelle, the Germans began a policy of isolating the HeHe. They made alliances with neighboring tribes hostile to the HeHe and slowly encircling the HeHe homeland. On October 26,1894, Schelle led a new German invasion. His forces included 609 askaris and three machine guns. Schelle went well-prepared and took no chances of an ambush. He steadily advanced toward Mkwawa's main fortress at Iringa, which was surrounded by a twelve-foot wall and an eight-mile long moat. The assault on Iringa came on October 30th after the Germans had discovered weak points in the fortifications. Even after the outer defenses were breached, the HeHe defenders were killed before the survivors, including Mkwawa, fled the stronghold. With the fall of Iringa, much of the will to fight left the HeHe. Most of them now capitulated, except for the most ardent supporters of Mkwawa, who refused to quit. Mkwawa reverted to guerrilla warfare, which dragged on for four years. Although Mkwawa had some success, he wiped out a thirteen- man garrison at Mtandi, in the end harassed, chased and cornered, he committed suicide in July 1898. The death of Mkwawa marked the destruction of the HeHe kingdom and power. As serious as had been the first two revolts to German control, they in no way rivaled the Maji-Maji Revolt which began in 1905. Resentment towards Arab and Indian traders and German settlers by the native tribes reached a boiling point in 1905. German rule was strict and taxes were high. Many natives were reduced to manual labor on German plantations, their independence and former lifestyles lost to them. In July 1905, members of The Kibata tribe working on the cotton harvest in the southeastern region of the colony refused to pick the cotton crop and then rose against their masters. The revolt quickly spread through the southern area of the colony. Missions, trading posts and plantations were attacked and destroyed between Kilosa and Liwele. Numerous tribes joined in the revolt. The German forces, with only 588 askaris and 458 police in the south, were powerless to contain it, one-fifth of the colony soon was in the hands of the rebels. Maji-Maji meant magic water. Holy men had created a potion of water, millet and various roots. This Maji-Maji potion was said to not only be able to restore good health and make crops grow, but could also stop bullets. With such a weapon, many tribes like the Ngori, Yao, and Bena joined the uprising. Interior German outposts like Mahenge and Songea were soon besieged. The rebels were poorly armed with few rifles and muskets. They relied more on arrows and spears, some of which were poisoned. They attacked in the open in a massive wave attack depending upon the Maji-Maji to protect them. Three events finally checked the growth of rebellion. The first occurred on August 30th when the Mbunga and Pogoro tribes launched a massive attack of 4,000 men on Mahenge. Defending the settlement was LL von Hassel and sixty askaris. The wave attacks were beaten back by heavy machine-gun fire. Losses amongst the natives were high. Unable to take the city by storm, the rebels besieged the settlement for almost two months before a German relief column arrived in November. The second was the failure of certain important tribes to join the movement as the rebellion swept into the northern part of the colony. The HeHe, for example, having seen what the German Schutztruppe could do, refused to join and actually fought for the Germans. Finally, military defeats at Mzee and Namabengo in late October caused despair. At Mzee, a well-planned ambush against a small German column failed. On October 21,5,000 Ngori warriors, who had gathered for an assault on the German garrison at Namabengo, were themselves attacked by the Germans in a night assault of their camp. Captain Nigmann and 117 askaris scattered the Ngori forces and smashed the power of the tribe. These events, which brought with them heavy losses, broke the morale of the rebels and shook their faith in Maji-Maji. The rebel offensive stopped. The Germans now went on the offensive. Upon the outbreak of the rebellion, Adolf von Gotzen, governor of East Africa, had requested reinforcements from the German government. Kaiser Wilhelm immediately ordered two cruisers with their Marine complements to the troubled colony. Reinforcements also arrived from as far away as New Guinea. When 1,000 regular soldiers from Germany arrived in October, Gotzen felt he could go on the offensive and restore order in the south. Three columns moved into the rebellious South. They destroyed villages, crops and other food sources used by the rebels. They made effective use of their firepower to break up any attacks the rebels might launch. A successful ambush on a German column crossing the Ruhuji River by the Bena kept the rebellion alive in the southwest, but the Germans were not to be denied for long. By April 1906, the southwest had been pacified. The southeast campaign degenerated into a nasty guerrilla war that brought with it a devastating famine. Not until August of 1907 were the embers of rebellion stamped out. In its wake, the Maji-Maji rebellion left several hundred Germans and 75,000 natives dead. It also broke the spirit of the natives to resist and the colony remained calm until the outbreak of World War I.
German involvement in Kameruun began in 1884 when trade treaties were signed with Dovala chiefs along the coast. Upon leaving the coast, the geography of Kameruun quickly becomes one of mountains and jungles. Because of terrain, the Germans did not attempt to expand their control into the interior until 1889-1890. Quickly wars with tribes living in the interior ensued and the Germans countered with the creation of a Poliztruppe in November 1891 to combat die natives. 370 Dahomeans were purchased by a military explorer, Capt. Freiherr von Gravenreuth, from their king who was planning to have them eaten at an upcoming feast. The Poliztruppe did not solve the problem, however. Gravenreuth was killed in an ambush by the Buea tribe near Mt. Cameroon. Shortly after his death the Dohomey troops mutinied against the new acting governor, Leist, a brutal man who had treated the soldiers badly and had commanded their wives be publicly whipped when the troops had complained about poor pay and terrible food. The government back in Germany now started the Schutztruppe in Kameruun on June 9, 1895. Ten companies, later enlarged to twelve, were established. Each company was to consist of 150 Africans or askaris. Some 1,550 enlisted and 185 were German officers and NCO's. Although no major conflicts developed in Kameruun, there was a series of small wars against interior tribes. The Buea were attacked and punished for the killing of Gravenreuth and the Schutztruppe proved its worth on numerous occasions. Togoland was the only German colony not to have a Schutztruppe. Instead they had a para-military police force. This police force was very similar to the Schutztruppe; the soldiers wore khaki dress, were armed with model 71 Mauser rifles and their German officers were regular German army who referred to their men as soldiers not policemen. The police force was divided into platoons based upon the tribal background of the men in them. In 1914, the force consisted of two officers, six NCO's and 560 enlisted men. As in the Kameruun, the fighting consisted of small wars against rebellious or independent-minded tribes. The most ardent opponents of the Germans were the Dagombe who resent the German control over traditional trade routes. In 1877, they rebelled against the Germans along with their ally, the Konkomba, who resented loss of the tribal lands. In May, Lt. Valentine von Massow and a force of ninety-one police marched into the area to quell the revolt. They were attacked at Adibo by 6,000-7,000 Dagombe and Konkomba warriors. Again it was the combined use of machine-gun and small arms fire and discipline which saved the day for the Germans. Some 500 natives were killed and their forces scattered. Shortly after the battle of Adibo, Massow and his men took the Dagombe capital, Yenbli, and burned it. The rebellion soon ended. Some of the heaviest fighting witnessed by the German colonial troops would be in German Southwest Africa. Made a protectorate in 1884, South-west Africa, because of its extensive plains and grazing lands, was viewed as an area for German settlement. The German Schutztruppe almost immediately began to move inland in order to secure lands for German farmers and settlers. Also in the colony were large numbers of natives divided into several large tribal groupings. In the north were the Ovambi numbering between 90,000-100,000. In the central region were the Herero, a tall healthy people consisting of nine tribes of 60,000-80,000 people. Finally, in the south were the Mama, or Hottentots, the smallest of the major tribes with 15,000-20,000 people. All of the tribes were semi-nomadic cattle raisers. The Germans played one tribe off against another, signed treaties and gradually expanded their control. The first real opposition to their plans came from one of the Mama sub-divided tribes, the Witbooi, led by Hendrik Witbooi. Witbooi refused to sign a treaty of peace and opposed further German encroachment onto their lands. German officials in the colony called upon the Schutztruppe to force Hendrik Witbooi and his people to sign. 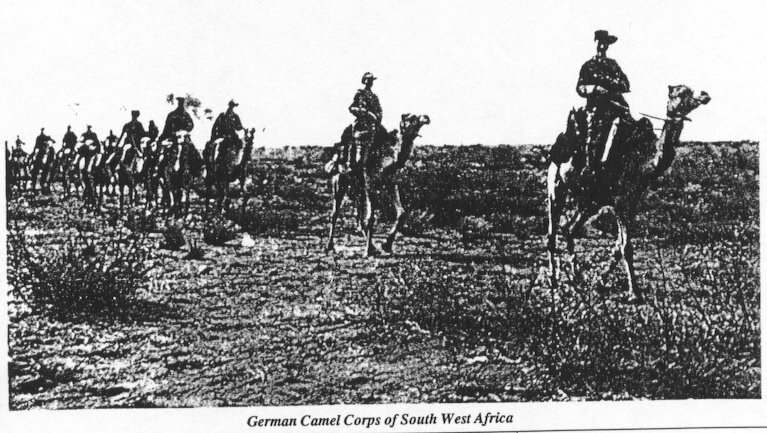 The Schutztruppe in German South-west Africa had been created in 1890. Its commander was Captain Curt von Francois. Eventually it would consist of nine field companies, one of which was mounted on camels, and three light batteries of artillery. However, at the start of the Witbooi war Captain Francois had few men and had to be reinforced from Germany before the campaign could begin. On March 16, 1893 two officers, one of whom was Francois' brother, Hugo, and 214 men landed at Walvis Bay. Reinforced, Captain Francois planned a surprise attack upon Hendrik Witbooi's stronghold at Hornkranz. After leaving a small force to protect his base at Windhoek, Francois set out on April 8th with two officers, twenty-three NCO's and 170 enlisted men divided into two companies commanded by Lieutenants Hugo von Francois and Schwabe. Four days later, on April 12th, Captain Francois' force arrived outside Hendrik's fortified city. Francois split his command, ordering the first company to attack the city from the east and the second company to attack from the north. The assault, launched early in the morning, was a complete surprise. Yet the Witboois quickly recovered and a very spirited resistance ensued. Inside the city, Hendrik had, besides women and children, some 250 men armed with 100 rifles and spears plus 120 horses. After the defense, which lasted up to three hours, Hendrik ordered the city abandoned. Behind them, they left 150 Witbooi dead; many of whom were women and children. The German forces returned to Windhoek in triumph. However, their victory celebration was short-lived. In quick retaliation, the Witboois raided a German horse post and drove off and captured most of the German horses. The German forces were for the time-being left on foot, making the well-mounted Witboois hard to catch. Even after a further 100 men arrived from Germany in June of 1893, Captain Francois seemed unable to regain control over the situation. In August, the Witboois struck a supply train of twenty wagons and destroyed it completely. Six months after the battle of Hornkranz, Hendrik was stronger than ever with 600 men, 400 rifles and 300 horses at his command. Receiving another two officers, ten NCO's and 105 men in August, the newly promoted Major Francois now felt he could move against the Witboois. His plan was to surround the Witboois, isolate them, then bring them to battle and defeat them. However, the more mobile Witboois kept slipping away while skirmishing with the Germans and raiding their rear areas. Only once did Francois get close to his objective. The battle of Onab valley was fought on February 1-2, 1894. The Germans brought everything they could into the fight including artillery. The fighting at times was heavy, but in the end, the Witboois once again broke off the engagement and fled into the surrounding hills. Losing confidence in Major Francois, the German government decided to replace him with Major Theodor Leutwein. Leutwein arrived in German Southwest Africa in February 1894. The 44- year-old Leutwein was to tip the scales of the war. Leutwein did not immediately move against the Witboois, instead he spent time meeting with and winning over neighboring tribes. He began to re-establish German control over the region while at the same time cutting off aid and support to Hendrik. In May Leutwein got Hendrik to agree to an armistice which was to last until the end of July. Leutwein hoped he could negotiate the Witboois into surrender, but if not, the break would allow time for more German reinforcements to arrive. Unsuccessful in getting the Witboois to surrender Leutwein was rewarded with a further 250 men who arrived in July. The final confrontation was now at hand. Hendrik and his followers had retreated to the Naukloof Mountains and their fortified positions there. Mustering his forces, Leutwein blocked off the various mountain passes, stopping any possible escape, and advanced into the Naukloof Mountains. The battle of Naukloof started on August 27. It was a wide-ranging battle which roamed over rough terrain. Both sides trying to control waterholes and advance points on the high grounds. Unable to break out and having lost the last of the Witboois-controlled waterholes, Hendrik surrendered on September 9th. The Witboois war had proved to be troublesome to the Germans, but nothing like the next campaign which would rock the colony. By 1904, a number of factors had led to unrest amongst the Herero, including an epidemic in 1897 which had killed one-half of the Herero cattle herds and the fact that German settlements and ranches were putting mounting pressure on various tribes to move. On January 12, the Herero, led by Chief Samuel Maherero revolted at Okahandja. One hundred farmers and settlers were quickly killed, but Maherero ordered that English, Boers and missionaries were to be left alone. The Herero could put roughly 7,000-8,000 men into the field. Up to half of these had firearms, but there was a lack of ammunition. Also a problem for the Herero was that their warriors moved their families and livestock with them. This not only slowed them down, but made them vulnerable to German counterattacks. The Schutztruppe under Leutwein were taken completely by surprise by the uprising. In January 1904, Leutwein's forces consisted of forty officers and 726 soldiers divided into four companies of mounted infantry and one artillery company. He also had a reserve of thirty-four officers and 730 enlisted, 400 German settlers with no military training and 250 native scouts and auxiliaries. His troops were armed with the model 88 rifle, plus there were five quick-fire and five older artillery pieces and five Maxim machine guns. There was also a number of small, but walled forts, with an armory, barracks and watchtower. However, Leutwein and three companies were in the extreme southern part of the colony, over 400 miles away, quelling a small revolt by the Bondelzwort when the Herero struck. With little opposition, the rebellion in the north spread rapidly destroying farms and ranches and attacking most of the German settlements and forts in the region. Okahandja and Windhoek were briefly placed under siege. Between January 19 and February 4, German troops were able to relieve both cities, but were not strong enough to take the offensive. However, reinforcements were arriving. Marines from the cruiser Habicht arrived on January 18th. During February and March another 1,576 men arrived from Germany along with ten artillery pieces, six machine guns and 1,000 horses. Reinforced to the point where Major Leutwein could put 2500 men into field the Germans began a three column counter-offensive in April. The columns were named the eastern, western and main. However, the newly arrived German troops were not conditioned for the climate and soon proved to be ineffectual against the seasoned Herero. The Eastern column, 534 men, were responsible for cutting off any escape routes the Herero might use to evade the other German columns. Almost immediately fighting with the hostiles took place. On March 13th, the eastern column made contact at the battle of Owikokorero. The Germans suffered thirty casualties and failed to stop the Herero from fading away after the skirmish. Shortly after that engagement the Herero ambushed the column at the battle of Okaharui. Two-hundred and thirty Germans, commanded by Major Glasenapp were in column on a road. The 4th Marine company led followed by artillery, two Schutztruppe companies, twenty-two wagons and the 1st Marine company which acted as rearguard. At a point where high bushes lived the road some 1,000 Herero attacked the rearguard. Their attempt to overrun the 1st Marines failed and the Herero retreated to the bushes where they kept up a constant fire upon the column. Finally the forward companies reeled around, attacked and drove the Herero off with a loss of forty-nine men. These losses combined with disease finally forced the Eastern column to retreat in May. The western column and the main column combined shortly after operations had commenced. They too made contact with the Herero at Onganjirn. Against 3,000 Herero, the Germans were able to defeat their attackers with superior firepower after which the Herero dispersed off the battlefield. In April, the Germans were once more surrounded and assaulted at Ovimbo only to have firepower save the day again. With so little success, Leutwein finally called off the offensive to await more reinforcements. It was his final act; the German government removed him and ordered General Lothar von Trotha to take command of the colony. Von Trotha, who arrived on June 11, was a seasoned colonial officer who had fought to East Africa and China. He was a hard ruthless man with little understanding or pity for the natives. The German government was also tired of the rebellion. In May and June, large reinforcements arrived until von Trotha had 10,000 men and thirty-two pieces of artillery. With such a large force, von Trotha was able to accomplish what Leutwein had been unable to do: encircle the Herero. The Herero came to rest in the Waterburg mountains where, some 6,000 fighting men and 4,000 dependents, began to dig in and prepare for the final battle. It commenced on August 11th when the Germans began to advance into the mountains. The artillery bombarded the Herero positions causing heavy losses to the noncombatants. The infantry converged on several fronts, thus making it hard for the Herero to fight everyone at once. Even so the fighting was intense. Unable to resist any longer, the Herero finally broke out and fled into the desert where they died of thirst and starvation. The rebellion had been broken, but von Trotha would not let up on the punishment of the hostiles. Not until 1905 were the Herero finally left alone, by this time a broken people. Three quarters of the nation were dead and the remnant destitute. Just as one rebellion ended another had begun. The Mama revolted in October under Hendrik Witbooi, now eighty years old. It was a foolish act. The Mama numbered 1,000-1,500 men with only one-third armed with rifles. This against German troops that now numbered 17,000. Even so it was a long and arduous guerrilla campaign with over 200 skirmishes and engagements. During the course of the fighting, Hendrik Witbooi was killed near Tses, and leadership passed to Jacob Morenga. In the end, this revolt too was smashed and the Mama suffered. Roughly one-half of the Mama were dead by the time the fighting ended in 1907. With this final campaign, the German colonial wars in Africa ended. In fact, the Germans would control their colonies for only another ten years before World War I ended their empire. Bley, Helmut; Southwest Africa Under German Rule 1894-1914. Bridgman, John; The Revolt of the Herero. Drechsler, Horst; Let Us Die Fighting. Iliffe, John; Modern History of Tanganyika. Iliffe, John; Tanganyika Under German Rule. Rudin, Harry; German in the Cameroons 1884-1914. Smith, Woodruff D.; The German Colonial Empire.